Winter themed parties can be so fun whether you are planning a baby shower, a holiday party or even birthday. You can design it to be for a gender neutral party, pink or blues for boy/girl or you can throw in a fun color by playing around with the color pallet. In my opinion to keep the theme consistent I would suggest you using the typical colors of the silver (or grey) white and then add your choice of color to make it pop. Well, I am really excited to share some fun ideas. Let's take a tour together as I share with you with party decor ideas from some of my favorite shops , inexpensive dessert ideas and some gorgeous Winter party inspirations from myself and other stylists. Hope you enjoy ! Desserts can get costly for any party. Some simple and inexpensive ways to add some fun decorations to your desserts is by adding some sprinkles to plain cupcakes (the ones pictured are from The Baker's Shop ) I then topped them off by adding cupcake toppers which can be purchased from my Etsy shop. I love how they came out. Aren't they so cute ? If you're adding cupcakes and other desserts to your party then you really don't need a huge cake. You can dress up a simple plain store bought cake or from your local bakery or grocery store. I purchased mine from Vons (a grocery store in California) and just requested a plain buttercream cake. I added pretty cake topper to it and that is it. Your cake is ready to go! Let's talk about how gorgeous these cookies are that my sweet friend Carolina over at Mint Event Design styled for her Winter Wonderland party! The right dessert style really can set the tone for your dessert table! I love that these sugar decorated cookies added the perfect winter touch to her winter wonderland party! I hope you found some sweet dessert inspirations for your winter desserts. Seriously!? Who doesn't love donuts!! I mean every time I offer donuts at a party it is literally GONE! So, I wanted to share this sweet photo of these gorgeous donuts that Amanda over at Dip'd _N_Drip'd created for a Winter ONEderland party I styled! They were so simple yet full of detail! What do you say. Do you agree? If you live in Southern California and need some yummy and gorgeous desserts Amanda is the person to call! It never fails, people just love how yummy her desserts are and are always impressed with her attention to detail. A friendly tip if you're looking to make your own decorated donuts. You can visit The Bakers Party Shop and get some snowflake and number "1" chocolate molds to create for yourself. You'll also be in awe with all other wonderful baking goods and ideas there as well. I am going to share some of my favorite and simple party decorations that you can add for your party. I just love this custom snowflake confetti from FestiveFetti on Etsy. I have worked with Brenda (the shop owner) a lot on customizing the confetti mixes to go along with my party themes and I just adore how perfect they always match. Confetti mixes are perfect to garnish on a table or to add some fun in your favor bags/boxes. Now, lets talk about how tassels are the cutest! I always feel like a table is naked without some type of garnishing in the front. So, I love to use tassels and string them in front of the dessert table's cloth. They are also perfect for photo shoots and backdrops. My favorite tassels to use are from Darlene over at 16 TASSELS. Her Tassels can be custom made to fit the color scheme of your party and the BEST part is that her tassels can easily come off the string. You can recreate so many looks by using other tassels and restringing them to your desired preference. Favors are such a sweet way for your guests to leave your party feeling happy for coming! I love the extra details that make it all count. I designed these favor bags that are just perfect for a winter themed baby shower. The glittery snowflakes and the mittens really add the perfect touch. Also, I would love to mention that I am offering FREE printable signs ! Yes Free! To all who subscribe to my E-mail List. This month the "Baby It's Cold Outside" is what I am giving out. You will receive the blue and pink. So your choice. I will be creating fun and new Free printables that I will be sharing each month. So, Join my party and sign up today. It just makes me feel so happy to know that I have such amazing friends who want to follow along. Hope you enjoyed all these fun party Ideas and please feel free to let me know in the comments what you loved the most and what else you would love to see. Have a wonderful day and thanks for stopping by ! 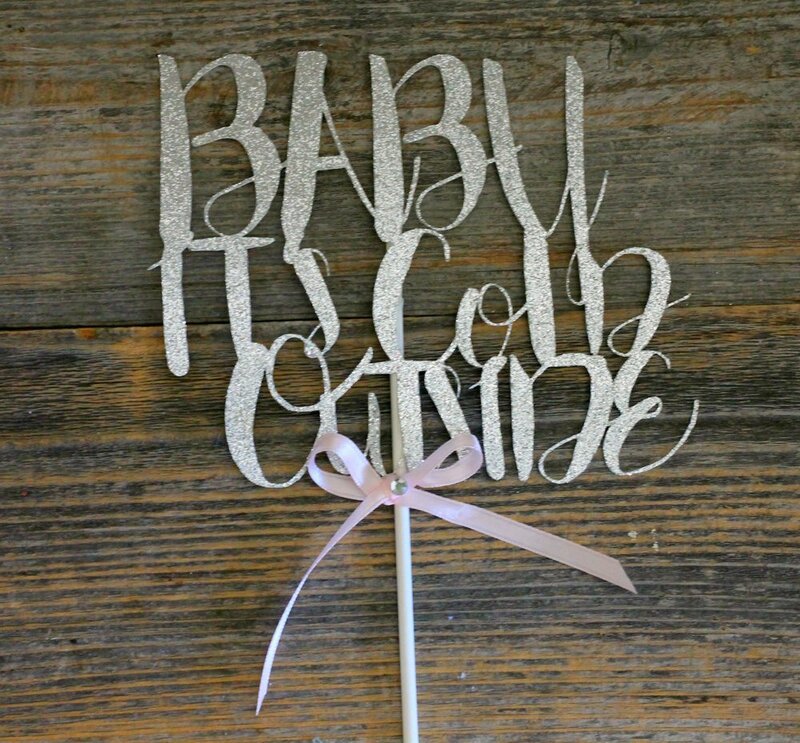 Older PostWarm up with some sweet "Baby It's Cold Outside" shower ideas here!